Most excitingly, eggplants taste great. And there are thousands recipes for preparing eggplants. My favourite dishes with eggplants are various dips. If you bake eggplants at 180C until soft, you can make many types of dips. The simplest: use olive oil, lemon juice, cumin seeds, cayenne pepper, salt and garlic and process. Or dice baked eggplant with tomatoes and sweet onion, mix with minced garlic and olive oil. In this post, I would like to share my recipe that I created many years ago. I cooked it very rarely then, probably because small children don’t usually like this type of cooking. In recent years, however, it has become a family favourite. Enjoy. 3. In the dry bowl mix Besan flour salt and pepper. Drain eggplant slices and shake the excess water off. 4. Heat up a cast iron frying pan with a little of sunflower oil. One by one cover eggplant in the flour mix, also shake off the excess flour and cook for 3-5 minutes on each side on small-medium flame. Transfer onto the plate covered with paper towel. Save some besan flour mix for the next step. 5. Spray a small wok with oil and cook minced garlic until fragrant. Stir in saved besan flour mix from the previous step. 6. Add cream and spice and heat through. If needed add extra seasoning. Don’t let the cream to boil. Continue mixing until smooth and creamy. If needed switch off the heat, then return. 7. Add prawns, cook constantly mixing for 2-3 minutes or until prawns change in colour. 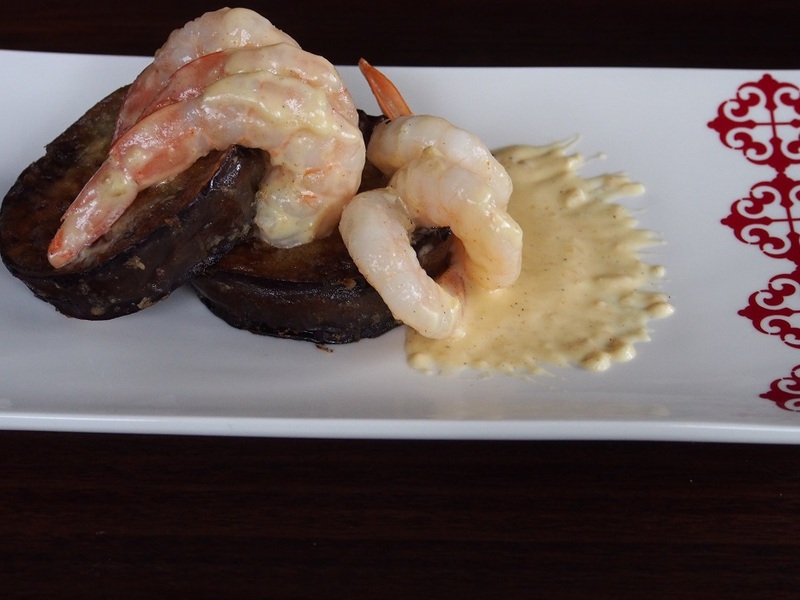 Cover cooked eggplants with prawns.